The Mphaphulis are the Singos. During King Thohoyandou’s reign, the Venda high priest (Tshifhe) was Gole, the founder of the Mphaphuli house. Oral history has it that Gole was nicknamed Mphaphuli due to the fact that, when in combat, he used to chop enemies to pieces. People praised him by saying that “Gole u phaphula maswina” (Gole chops enemies). People started calling him Muphaphuli. This was later corrupted to Mphaphuli. 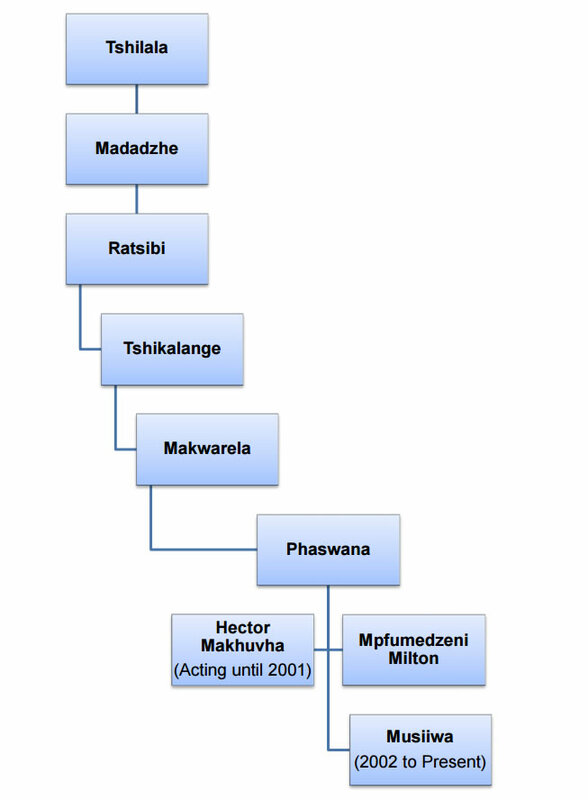 During King Thohoyandou’s reign, the Vhavenda kingdom was divided into different chiefdoms ruled by people from the Singo clan appointed by Thohoyandou. This was done to entrench and consolidate Thohoyandou’s hegemony over the entire nation. Munzhedzi Mpofu, Thohoyandou’s son, occupied the southwestern flank of Venda with a base at Songozwi (present day Makhado town). Tshisevhe, Thohoyandou’s brother, occupied the Mutale valley with a base at Makonde. Raluswielo (Tshivhase), who was also Thohoyandou’s brother, occupied the central highlands flanks with its base at Phiphidi. Tshilala Mphaphuli, Gole’s son, occupied the south-eastern flank with its base at Tshitomboni. Tshilala was given the responsibility of protecting the kingdom from invaders from the south-east. Tshisevhe was defeated in the war of succession and was assassinated by Munzhedzi Mpofu. 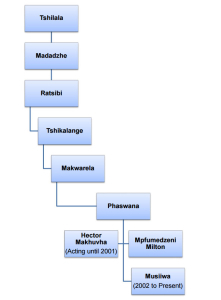 Tshisevhe’s son, Ravhura, fled to Makonde after his father was assassinated in the war of succession. Munzhedzi Mpofu became the new king of Venda. But Raluswielo (Tshivhase), who was at Dopeni, wanted the kingship. He attempted to return to Dzata to usurp the throne. Raluswielo, just like Tshisevhe, was defeated by Munzhedzi Mpofu. After Tshisevhe’s assassination, Tshilala decided not to get involved in the war of succession. He stayed at Tshitomboni and decided not to have anything to do with the events at Dzata. But he later left Tshitomboni to settle at Miluwani. Tshilala settled at Miluwani because he was afraid that the Ramabulanas would attack him at Tshitomboni. Tshilala later moved from Miluwani to Mbilwi. The song laments the fact that the cattle are being snatched by Malema the cannibal. Madadzhe was killed at Tshakhuma by Madzivhandila’s warriors after he went to Tshakhuma with the intention of snatching Khosi Madzivhandila’s wife. It is said that Madzivhandila’s wife was extremely beautiful and Madadzhe wanted her for himself. Madadzhe was succeeded by his brother Ratsibi. Ratsibi was succeded by Tshikalange. Tshikalange was succeeded by Makwarela. ‘Nando’ means ‘furnace’ or ‘oven’ in Tshivenda. Iron used to be mined and smelted at the place where Nandoni Dam is situated. The area where the ancient mine and smelter were found was, therefore, referred to as Nandoni, meaning the place of the furnace. Nandoni dam is a beautiful recreational facility. It is situated at Mulenzhe village and its catchment stretches from Makhado in the west to Malamulele in the east. The overall length of the dam wall will be 2,215 meters after completion. The height of the dam wall is 47 meters. 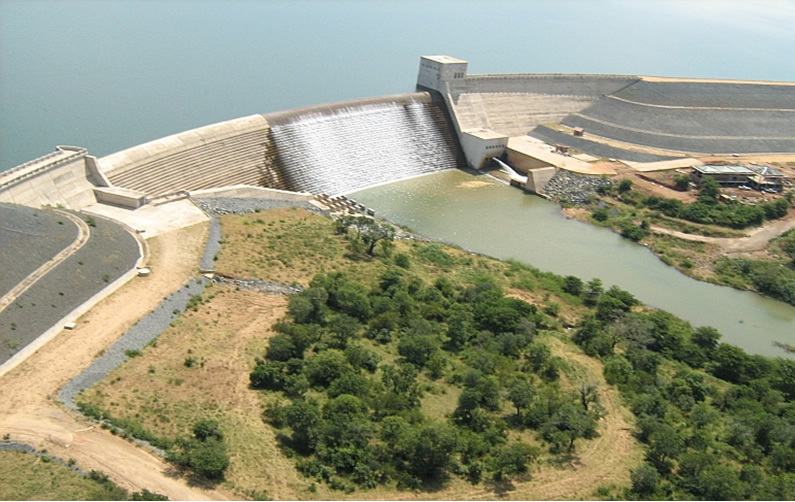 The dam was initially known as Luvuvhu Dam, but the name was changed to Nandoni Dam in 1995. Its main purpose is to supply water for domestic use. The areas and communities that benefit are the urban areas of Makhado and Thohoyandou and the rural communities in the northern part of Vhembe district. The estimated total cost of the Nandoni Dam is R373,3 million. Nandoni Dam, Found at Tshitomboni, Thohoyandou.